Welcome to Sea Park Beach Resort! 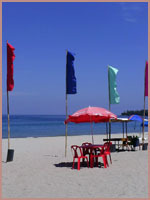 Sea Park is famous for its fine sand beach and clean, calm, crystal clear and sparkling waters. The beachfront cottages and restaurant offer the best place for relaxation and superb dining experience overlooking the South China Sea. Experience the fun hot sun during summer and the ripples of water and cool breeze during rainy season. Squander and take the pleasure of serene and romantic sunset. Sea Park Beach Resort caters to all your leisure needs whatever the climate and weather conditions; we assure unique experience that only Sea Park can offer. Ideal place to unwind and get away from urban pressures and hassles. Enjoy the comfort of your home by the sea.